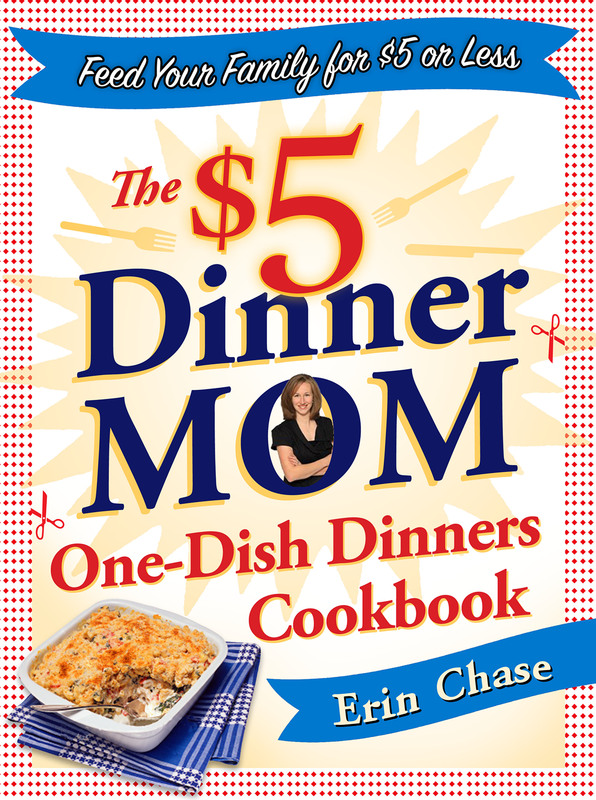 Erin Chase, The $5 Dinner Mom, knows that one-dish dinners are family-pleasing, budget-friendly and easy-to-prepare. 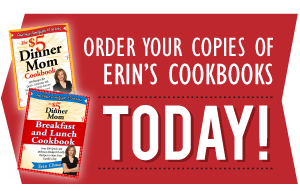 In her crusade to help families across America eat well and stay on their budgets, Erinâ€™s back with a treasure trove of more than 150 delicious suppertime solutions all prepared in one skillet, baking dish or pot. And none of them will break the weekly budget because they all cost no more than $5 to prepare. After a long day at work or school, how about a plate of sizzling beef fajitas and warm corn tortillas? Need a mid-week pick-me-up? How about turning Wednesday nightâ€™s dinner into a celebration by cooking a scrumptious creole chicken and shrimp pilaf? Chilled to the bone in snowy late January? How would you like to come home to a hot and bubbling Swiss chicken casserole? Erin’s even included a few $5-and-under desserts like Mango Raspberry Crumble, and Pear, Apple and Caramel Crisp to round out a meal on nights when the budget allows. 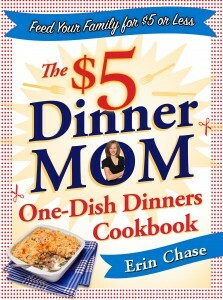 With her new book, Erin Chase shows America that it’s not only possible to eat right, eat well and stay on a budget. She also shows us how easy it can be to clean up quickly and spend more time with the family. They will be available for purchase on Amazon and other major book retailers, starting September 4th. I will be doing several giveaway promotions on $5 Dinners and here on One Dish Dinners in the next few weeks. I love my crock pot and cook lots of meals in it. Thank you for the opportunity to win a cookbook! Can’t wait to try Mango Cranberry Crumble sounds great. We use the crockpot whenever we can, especially on school/work nights. That night’s dinner becomes the next day’s lunch! Love the website and would really LOVE to win this cookbook! Being a senior would really appriciate a cookbood like this! a big FB fan of yours — congratulations on another boy! my favorite money saving tip is to not throw away leftovers. If we get tired of eating a big batch of chili, etc. I just package up the leftovers in a freezer bag, smooth it flat, label it, and add it to my freezer “filing system” of flattened, frozen meals. I dont know if this posted, please delete if it is a duplicate, I do not see it on here. I love you website. I save time in the kitchen when I use my crockpot. and do once a month cooking. I love your cookbooks and all your tips to buy ,freeze meals for later. A great site to go to! Love the daily emails and have enjoyed several of the recipes shared! Would LOVE to win a cookbook! Looks great, I can’t wait to see all the recipes and start cooking! Loved your other books! Truly can’t wait to read and use this one! Thanks for the opportunity to win it! You can definitely see your enthusiasm in the paintings you write. The arena hopes for more passionate writers like you who are not afraid to mention how they believe. Always follow your heart. with your web site! Iwill probably be back even more often. Am looking forward to getting your book. Lights are one particular of the most crucial things of a room. Present-day property proprietor would like a bathroom designed for model and comfort. With the DROID, Motorola has perhaps produced The largely beautiful and stimulating sample of machinery yet. The sleeves of his shirt were rolled up showing off his muscular arms. 2GB, which is not bad at all. tipping bucket, shallows and slides of the “Kids Park”. Mario series, in that all the movement is from left to right, no moving around things or different camera angles. important elements in science fiction films: special computer manufacturers and imagination and creativity. undertow at the beach in Copa dragged me down and out. written Westworld), and one that instills life lessons through the use of terrorizing monsters. the limestone cliffs that occurred over millions of years. stone. It is an obvious great choice for any “galaxy far, far away” themed event, promotion or party. there are many arcades and go kart tracks for your entertainment. that you can use to ensure that you get the best deals on cheap flights.